alright! so this one is embarrassing, as I will be promoting myself on the blog. However, folks from Yourstory have given a decent coverage to SimplyLearnt's ideas and thoughts. 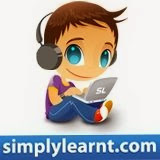 Please find reviews about SimplyLearnt on YourStory over here.